View these docs to setup churn tracking with your billing system (i.e Stripe, Recurly). To enable churn tracking, navigate to the Churn section in your Account Settings. via a customer trait - Select this option if you have some 'churn' flag attached to customers as a trait when tracked with your analytics service - e.g. each customer has a isChurned trait in Segment/Mixpanel. via an event - Select this option if you send an event when customers cancel their subscription/account - e.g. your analytics service sends a Account deactivated event when a customer cancels their account. via a customer trait - Select the trait that flags a customer as churned - e.g. the isChurned trait. via an event - Select the event sent whenever a customer cancels their account/subscription - e.g. the Account deactivated event. Once an account churns, we move that account out of the default view of accounts so you can better focus your efforts on active accounts. 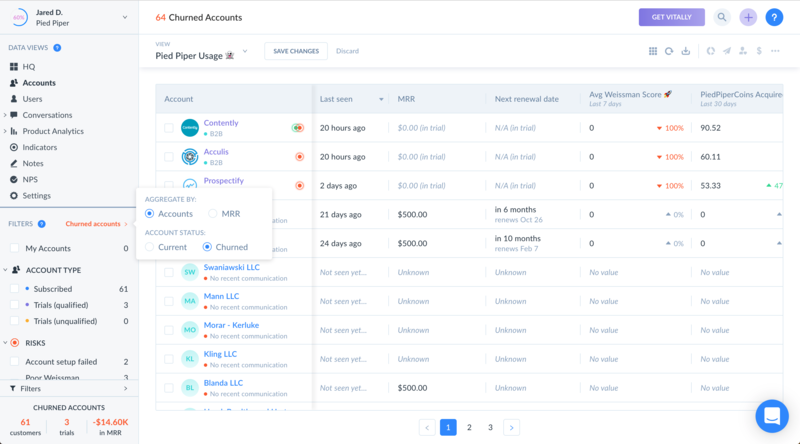 However, you can easily view your churned accounts via the Current accounts link displayed in the Filters section of navigation.